The proceedings of a conference organised by the European Commission Joint Research Centre Institute of Advanced Materials. 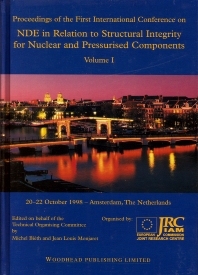 The conference was held in Amsterdam, the Netherlands in October 1998 and covered all aspects of this highly important subject including links between structural integrity requirements and NDE performance. The development of performance demonstartion / qualification for NDE systems and experiance of their application in practice feature prominently. Development of improved NDE systems, new methods of NDE and methods for assessing NDE performance such as modelling are also included. Over 100 papers were presented at the following sessions: Advances in non-UT methods; Structural integrity and NDE; Austenitic component inspections; Modelling; Materials properties measurement; Major component inspection; Pressure vessel inspection; Advances in ultrasonic methods; Organisation of NDE; Steam generator tube inspection; Primary circuit and internals inspection.